Tourist Attractions : Lakshman Jhula, Ram Jhula, Raghunath Mandir, Triveni Ghat, Gita Bhavan, Bharat Mandir and Ashrams. Best Activities : Yoga & Meditation, river rafting, yatching, kayaking, canoeing. Nearby Tourist Destinations : Haridwar, Nainital, Gangotri, Yamunotri, Badrinath, Kedarnath, Rudraprayag. Rishikesh, the gateway to Himalayas, is considered as the Mecca for Yoga and Meditation centres. Rishikesh nestled in the Tehri-Garhwal region of Uttaranchal abounds in natural splendour. The spectacle of the Ganga rushing through the Himalayan foothills is an awesome sight. Several temples dot the banks of the Ganga at Rishikesh. Rishikesh is located at a height of about 1360 feet above sea level. It is believed that several yogis and sages lived and practised penance here. The bridge has been a major attraction among the tourists to Rishikesh. RishikeshThe suspension iron bridge Lakshman Jhula was build in 1929. This is where Rama's brother Lakshaman is said to have crossed the river on a jute ropes. One can enjoy the spectacular surroundings and the cool breeze from the River while standing on the bridge. Another suspended bridge close to Lakshman Juhla is the Ram Jhula- This suspended bridge was recently build between Shivanand Ashram and Sawarg Ashram. It is similar to the Lakshman Jhula. Ram Juhla is also known as Shivanand Jhula. 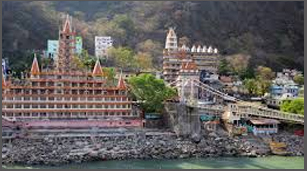 It is the most important places for religious ceremonies in Rishikesh. It is believed that the Ganga is joined here by the Yamuna and the Saraswati Rivers. Geographically, however, the Yamuna joins the Ganga in Allahabad. The dusk Aarti on the Triveni Ghat is most impressive. It is the oldest temple in Rishikesh. The image installed here has a distinctly Himalayan cast of features. Though the temple is dedicated to Lord Mahavishnu, it holds a number of image normalley associated with the worship of Lord Shiva. There are many important ashrams in Rishkesh. 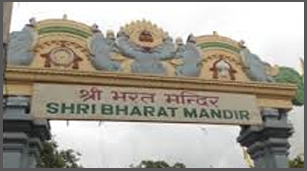 Most ashrams are centres for spiritual studies which also calls for Physical disciplines. Some ashrams, however, are monasteries. Among the better known ashrams are :- Paremarth Niketan, Sivanand Ashram, Yoga Niketan, Omkaranand Ashram, Vanprastha Ashram, Ved Niketan, Dayanand Vedanta Ashram, Vanmali Gita Yogashram, Shankaracharya Nagar Transcendental Meditatation Centre, Vithal Ashram and Yoga Study Centre. Train : The nearest railhead is at Haridwar, about 21 km from Rishikesh. There are morning and evening trains for Delhi to Haridwar. On can take a bus, car from Railway station to reach Rishikesh. Road : Rishikesh is well connected to all major cities of India by road. Some important road distances from Rishikesh are - Badrinath 301 kms. Delhi 224 kms. Dehradun 43 kms. Kedarnath 228 kms. Gangotri 258 kms yamunotri 288 kms. And Uttarkashi 1 54 kms. Being a very popular tourist destination, Rishikesh has ample accommodations for the tourists coming from all over. It has numerous accommodations located in & around the town. We offers you best accommodation in the Rishikesh. The accommodations available here ranges between luxury and budget. The hotels offers good length of facilities and services which are ideal for both short and long journeys. Pick the one which is most ideal for you.